ToeJam & Earl is the 1991 co-operative action/dungeon crawler developed by Johnson Voorsanger Productions and released exclusively for the SEGA Genesis/Mega Drive. The brainchild of Greg Johnson, co-founder of Johnson Voorsanger Productions, ToeJam & Earl is a decidedly unique game in that it forgoes many of the predominant staples of console video games at the time by making use of procedural generation and random elements inspired by the computer game Rogue. At the start of every game, a single player can choose to play as either ToeJam or Earl — each character has their own unique attributes, with the lithe ToeJam boasting faster movement speed and husky Earl having more health — and choose to explore a fixed or random world, each consisting of 25 levels, not including an additional epilogue level. Fixed worlds have a predetermined layout, whilst random worlds are just that — completely random. Other elements of the game, such as the location and contents of item-containing presents, enemy density and placement, the appearance of non-player characters, and various items strewn throughout each level are also completely random regardless of which type of world the player chooses. Though not at all a heavily story-driven experience, the story of ToeJam & Earl is nevertheless a fun and whimsical tale that sees two best friends — the titular ToeJam and Earl — trying to reclaim pieces of their wrecked spacecraft after crash-landing on Earth. Earth — or what remains of it — is painted as a hellish dreamscape, torn asunder and left to decay. Garbage and refuse litters the ground, and horrible monsters in the form of evil dentists, nasty mothers and their loud, obnoxious spawn, insane ice cream truck drivers, and packs of wild nerds stalk the land. Armed with only their wits and ingenuity, ToeJam and his buddy Earl must face off against impossible odds if they wish to return to their home world of Funkotron. This is no hyperbole — ToeJam & Earl can be a maddeningly difficult game, and it takes genuine skill, and perhaps a bit of luck to beat. With that being said, the addition of save states in this version are most welcome, and it does help to mitigate some of the more frustrating sections of the game. ToeJam & Earl sets itself apart from the crowd not just by the merits of its unique gameplay, but in its presentation as well. As much a homage of urban culture of the 1980s and ’90s as it is a parody, the game flaunts itself in a manner that is as silly and bizarre as it is engrossing. While the design of the characters, enemies, and world can be taken at face value, the idiosyncrasies found within suggest a deeper meaning, as if the game is a parody of Earth itself, creating a social commentary that inspires as much laughter and amusement as it does uneasiness. 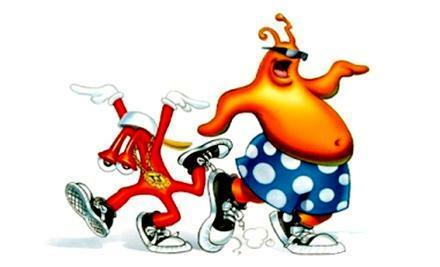 The graphics themselves are very crisp and detailed, fully capturing the personality of ToeJam and Earl through highly detailed and unique animations. Alongside it’s visual design, the music of ToeJam & Earl manages to perfectly realize the personality and attitude of the game, which is unapologetically fresh and funky. Though the game only has a handful of unique tracks, each is upbeat and enjoyable, offering a fully distinct sound that incorporates elements of funk, hip-hop, and jazz, among other disparate styles of music into their compositions. In terms of its production, the music is relatively minimalistic, consisting of just bass, drums, keys, and occasional record scratches at most times. Despite its uneven difficulty and the sparse, repetitive nature of its music, ToeJam & Earl is a fun, engaging, and a wholly unique game that is worth experiencing. A sequel to the rouge-like co-operative adventuring original ToeJam & Earl, Panic on Funkotron completely drops almost all of the mechanics the previous game was known for, instead creating a 2D side scrolling platformer. The key features of collection based gameplay and optional (and recommended) two player teamwork play return, however. 2D platformers were extremely overexposed at the original time of release, but this game focuses away from skill-based jumping and attacking like what is expected of the genre. This however makes the game feel very slow and sometimes monotonous, far more so than the original simply due to the loss of no option for randomly generated levels. Starting directly after the ending of the original, the title characters return home only to find that earthlings followed them to their planet, only to become a menace in the strangest possible ways. With this, the humor of the original remains completely untouched. Purposely bizarre, ToeJam & Earl 2 especially comes to life with it’s wonderful and massive amount of animations for all characters in several types of situations. Almost 20 years old now, the game still looks just as if it was a cartoon and not a game emulating one. If nothing else, the game deserves appreciation on this alone. Panic on Funkotron’s only real advantage over the original is that it is far more accessible and easier for children to play. This is hurt somewhat due mostly that the game also features far, far more dialog than the original. The newly added “Lil’ Kid Mode” allows the vast majority of the game to be played solo or in co-op with the the ability to die completely removed. This is perfect for ill-experienced players, especially for parents and very young children to play together, which was likely the intention. Be sure to check out more of our overview of other SEGA Vintage Collection titles here. This entry was posted on December 13, 2012 at 4:33 pm and is filed under Genesis/Mega Drive, M2, PlayStation 3, PSN, Review, SEGA Vintage Collection, Wii, Wii Virtual Console, XBLA, Xbox 360. You can follow any responses to this entry through the RSS 2.0 feed. You can leave a response, or trackback from your own site.